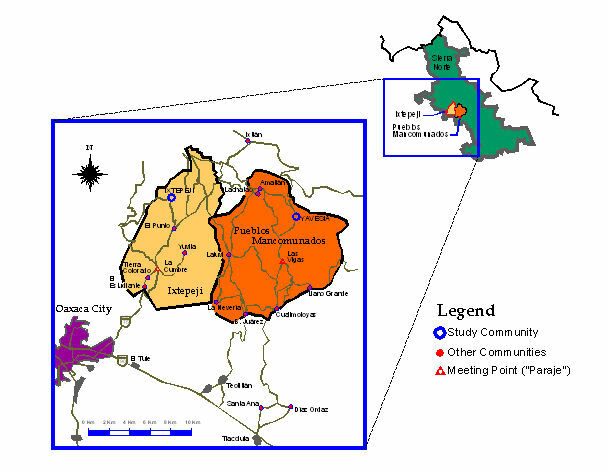 This paper examines personal experience as both a sociologist and forester collecting data in the southern state of Oaxaca, Mexico. It builds on writings where researchers have taken an introspective or auto/biographical approach to problematizing their own involvement. My findings illustrate that demographic and social features such as gender, nationality, and language can both hinder and privilege social science research. Moreover, this paper disputes the contention that expertise in a given specialty automatically makes for good field research. Depending upon the type of research and the questions being addressed, previous professional experience may actually hinder the building of rapport in certain cases. Genuine efforts to engage in local discourse can ultimately serve to improve fieldwork, and contribute to mutual understanding. 1.1 Sociological fieldwork presents a unique set of challenges. Among these, significant disparities such as gender, race, religion, or class likely exist between the researcher and the researched. While certain differences may be overcome, others may not. Such distinctions are occasionally used to mutual advantage (Metcalf, 2002; also see chapters in Whitehead and Conaway, 1986). Other factors such as negotiating entry and building rapport change according to the circumstances often outside of a researcher's control, and hopes for maintaining neutrality are occasionally dashed. A researcher's own 'history/biography' may also overlap in relation to particular social locations (Stanley, 1993). As social scientists, we can only address such dilemmas by realizing that our research activities say as much about ourselves as those we choose (or who let us choose) to be researched (Steier, 1991). 1.2 Given these fieldwork challenges, I examine here the complexities of fieldwork through a 'confessional tale', focusing on recent research in two mountain communities of southern Mexico. In brief, 'a confessional tale is that of a fieldworker and a culture finding each other and, despite some initial spats and misunderstandings, in the end, [hopefully] making a match' (van Maanen, 1988:79,94). Max Weber (1949) and C. Wright Mills (1959) were among the first in sociology to write about personal involvement in research. One of the best-known examples of the confessional genre can be found in the Appendix to Street Corner Society, William Foote Whyte's (1981:279-358) timeless urban ethnography of street gangs (cf., Behar, 1999). Other fieldwork reflections are abundant in the literature (e.g., see Golde, 1986; Haley, 1999; Kearney, 1992; Ladino, 2002; Metcalf, 2002; Rabinow, 1977; van Maanen, 1988; Vázquez García, 2001; Whitehead and Conaway, 1986). The confessional tale is also part of the emerging trend in auto/biographical research (Cotterill & Letherby, 1993; Stanley, 1993; Steier, 1991). Still, mainstream academia has not wholeheartedly embraced this genre (van Maanen, 1988). Without such introspection, social science research results may not only seem somewhat dry; they can obfuscate how challenges were faced and addressed in the field. 1.3 This paper explores how I, a foreign researcher in Mexico, was received, constructed, interpreted, and even altered by 'others'. The use of 'I' is deliberate, since I agree with Gayle Letherby and others who believe that by '[w]riting as 'I' we take responsibility for what we write' (Letherby, 2003:7; see also Cotterill and Letherby, 1993; Stanley, 1993). More specifically, it highlights field strategies in my shifting role as a forest sociologist. My success or failure rested on my ability to recognize multiple identities and motives assigned to me by respondents (see also Ladino, 2002:6.1). Recognizing that 'it is the researcher and not the respondent who gains privileges and advantages' (Letherby, 2003:120), the onus was on me to deconstruct, alter, or adapt such perceptions. My positionality - as a forester, a sociologist, a development worker, a foreigner, a male, a friend, a stranger, etc. - admittedly privileged me, although sometimes due more to good timing than to a carefully thought out positioning of 'self'. Yet, at times these epistemic typologies also worked to my disfavour no matter how hard I tried to downplay my cultural predispositions. 1.4 In this paper, I first briefly discuss related field research in Mexico for comparisons. This is followed by an analysis of field research challenges and their implications for understanding. I end with a synopsis for other researchers conducting fieldwork in unique cultural contexts. 2.1 Many Oaxacan social scientists have at least partially situated their field experiences within their respective works (Cohen, 1999: xi-xiv, 1, 85-87, 107-109, 175-176; Rubin, 1997: ix-xii, 3-6). Other researchers have more explicitly reflected on their field encounters in various Oaxacan communities. An example of this latter approach is Campbell's (2001) personal account of the dynamic tensions and contradictions of his fieldwork on radical politics in Juchitán, Oaxaca. Campbell calls for a rethinking of rapport or 'bonding', and recognizes his multiple roles as a white, foreign, and political activist researcher once married to a local woman. His forthright discussion of alcohol as an unorthodox rapport-builder in the bohemian cantinas and velas (fiestas) of Juchitán also shares similarities to Laura Nader (1986) and Michael Kearney's (1992) accounts. 2.2 Some Oaxacan researchers encountered villager's doubt as to their motives, especially during the early stages of their work. Nader (1986) was accused of being a Protestant missionary and Kearney (2004) was suspected of being a gold prospector. Both went to some pains to correct these mistaken notions. In Nader's case, the village priest consulted an outside source to verify her credentials as a Catholic anthropologist. In contrast, to explain his presence in the town, Kearney placed much of the 'blame' at his muy duro (very strict) professors at Berkeley for sending him to such a forlorn place (Kearney, 2004). This was more believable than the 'real' but boring explanation of just wanting to study the locals. Jeffrey Cohen and his wife taught English during their stay in Santa Ana del Valle, which led some villagers to believe that they were part of a government project to train workers in a foreign language (Cohen, 1999:107-109, 175- 176). Once they had arranged to work as maestros (teachers), they gained a new and lasting identity. They were transformed from 'odd gringos', sharing little in common with their neighbours, to accepted members of the village, without losing their status as 'outsiders and oddities' (Cohen, 1999:109). 2.3 Outside of Oaxaca, anthropologist François Lartigue (1983) spent several years studying forestry exploitation among the Sierra Tarahumara of Chihuahua. Lartigue's relationship with his respondents was always in flux, a negotiated balance that was better seen from being on 'the edge', never too far inserted nor external to the community: 'What I saw and what was told to me, took place within a relation in constant process of modification' (Lartigue, 1983:141). Another self-reflective account can be found in Carolina Ladino's (2002) fieldwork account in the shantytowns of northern Mexico (Juárez). As a Colombian feminist, and unlike white, western researchers in Mexico, Ladino felt that her fluency in Spanish and cultural empathy would help her gain acceptance. To her surprise, local Juarenses consider Colombians as 'southerners', and stereotype them as backward, dirty, and untrustworthy. Foreign researchers were expected to 'look' western. One interviewee made this comment when Ladino attempted to describe the purpose of her visit: 'Carolina, you make yourself sound so important, like one of those researchers from abroad!' (Ladino, 2002:4.6). It was her experience of 'shared vulnerabilities', however, as a female living in a dangerous situation of unprecedented urban violence against women that helped her to gain trust and build friendships. Ladino also recognizes that host populations construct and re-construct identities of the visiting researcher while in the field, and that the boundaries of 'differences' are in constant flux. 2.4 Notably, the above researchers are all non-Mexicans. This may explain partly why so much emphasis was placed on their gaining entry into a community. In contrast, Olga Montes García has recently reflected on her research experiences on urban entrepreneurs of Oaxaca (Montes García, 2001). She was cognizant of her role as a female anthropologist, a Oaxacan native, and a Zapotec descendent, but also the stigma attached to being perceived as from a lower social class than those she studied. In order to 'objectively' understand her respondents, and given the subtle racism she encountered, it was incumbent upon her to hide feelings of antipathy. In so doing, she was able to re-evaluate herself in a new light as both 'dominated' and 'dominant'. Her time spent with Oaxacan elites was in sharp contrast to previous experiences with indigenous peoples of the Sierra Norte. With some irony, she notes that the indigenous campesinos (peasant farmers) respected the researchers' position of privilege and knowledge, whereas the reverse was true with the elites.